Moira O’Boyle’s Dad, Cyril, was a club mate of mine at Clydesdale Harriers for many years and we must have covered hundreds of miles together, so I have known Moira for a long time. They were a superb family to know and be friends with. Her Mum Noreen became a runner eventually – and a good one – and her sister Pat was always in evidence but couldn’t be a runner because of asthma. I remember at the 1986 Commonwealth Games when Moira was coming on to the track to start the Marathon and I was standing waiting for the Scottish contingent to come out. She came over to me and asked if I could make sure her Dad got a cup of tea because ‘he’s had nothing all morning.’ In the mid 1990’s I was at Cumbernauld for the International Cross Country races and as I was crossing the infield to shout encouragement (or something) to one of my runners, this voice behind me said, ‘You don’t recognise me, do you?’ I did recognise her immediately: thinner than of yore but she had been ill and she was with the Irish team in some official category and we had a good old blether until she had to go and see how the Irish runners were doing. So if she’s Irish, why is she here? She’s here because she was more Scottish than some who might be included! Brought up in Clydebank, trained at Whitecrook in Clydebank and Scotstoun in Glasgow; winner of Scottish titles on the track and over the country, Scottish Internationalist until the whole family moved back to Ireland in the late 70’s Let’s look at her career in a bit of detail. Moira was born on 20th August 1956 and the first trace of her in the Scottish Women’s Cross Country Championships is in 1970 when she was sixth in the Girls Race in a time of exactly ten minutes. Two years later she was second in the Intermediate age group to Mary Stewart – sister of Ian and Peter Stewart. The next year was very good one for Moira and the ‘Athletics Weekly’ report on the Scottish Championships in Edinburgh in 1973 runs as follows: “Mary Stewart did not appear to defend her Intermediate title, thus robbing the meeting of its expected highlight – the clash of Mary and the bang-in-form Moira O’Boyle. In the absence of her most formidable rival, Moira beat another Anglo-Scot Sheila Barrass by over a minute.” The actual times were 15:48 and 16:53. In 1974 Moira was competing in the Seniors Championship at Milngavie, the AW report read: “Fulfilling all expectations, Moira O’Boyle continued her already distinguished career by winning the Scottish Senior Cross Country title in 22:04. Although this is Moira’s first year as a senior, she made her mark in this section at the first attempt. On this form Moira might well be a surprise medallist in the International Championships at Monza, in Italy, in March.” The official times were 22:04 and 22:26 for Christine Haskett in second. This year also marked the first run in the event of her mother Noreen who finished nineteenth. Among her successes in 1974 was a win in the prestigious GB Universities Cross Country Championships. Moira did not run in 1975 because of “adverse effects of smallpox vaccinations for Morocco.” The championships in 1976 were held in Livingston she was over a minute behind Chris Haskett (21:03 to 22:06). Noreen was twenty fourth this time. Moira had a rather good run at Louvain in France when she ran for the British team in the World Students Championships to finish second leading the GB team to victory. She was also considerably good on the track. In 1969 as a Junior the longest distance which she was allowed to run was 800 metres and she was ranked eighth with a time of 2:54.7. Two years later, in 1971 she was running as an Intermediate and won the West District Intermediate 1500 metres in 5:07.9, was second in the East v West Match in 4:57.7 and was second in the Scottish intermediate 1500 behind Mary Stewart in 4:47.2. In her own age group she was ranked fourteenth in the 800 with 2:28 and second in the 1500 with the 4:47.2 time behind Mary Stewart’s 4:35.5. In 1972 she was West District and SWAAA 1500 metres champions with a best of 4:44.1, third in the Scottish Senior 3000 metres and a season’s best of 10:21.6. In 1973 Moira won the West District 1500 metres and 3000 metres titles and was second in the Scottish 3000 metres with season’s bests of 4:54.4 and 10:05.8. The following year she won the West 3000 metres title and had a best for the year of 9:58.2. which ranked her second in Scotland and then in the East v West match she won both the 1500 and 3000 metres in 4:52.2 and 10:30.4 – she was just 19 at the time. In 1975 she had a best for the 3000 metres of 9:57.8. The family moved back to Ireland in the late 1970’s and Moira moved up to the marathon in 1982 – a step up that he father never made. Cyril was an Irish champion and International class athlete who created quite a stir when he arrived in Scotland but although a very talented road runner he never took the final step to the ultimate road runner’s distance. Moira did and, I believe found her real metier. Colin Youngson ran for Victoria Park AAC for a year or two while teaching at Kelvinside Academy and he has some interesting and informative memories of Moira – and the rest of the family. What follows is an extract from his memories of this time: there is some duplication of what has been written above but not too much and there is a different emphasis. Ronnie Kane had been in a brilliant Victoria Park team that won the Edinburgh to Glasgow Road Relay on many occasions in the 1950’s. He was now Captain of Victoria Park AAC and decided on the routes for the fast pack/slow pack club training sessions around the streets in Tuesday and Thursday evenings. Ronnie also coached the ‘Ladies Section’ which had only been formed three years earlier (ie 1968). They were very quickly successful and their undoubted star was then only 15 years old: Moira O’Boyle. Her parents were also good runners. 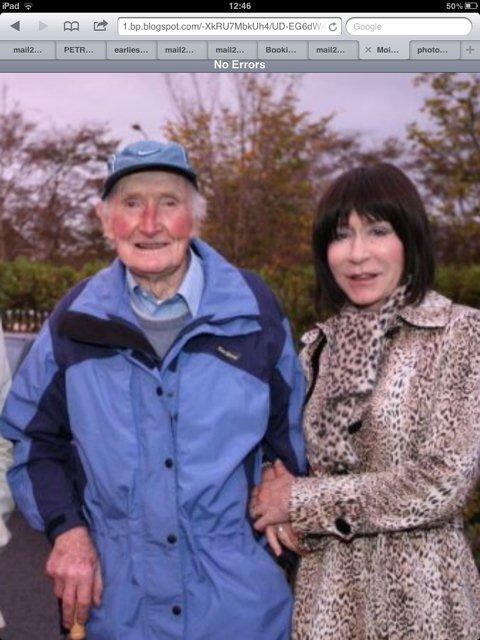 Cyril O’Boyle, a loquacious, droll Irishman who ran for Clydesdale Harriers and his charming wife Noreen. The club mag bemoaned the fact that despite doing all her training with Victoria Park, Noreen continued to race with Clydesdale which prevented Victoria Park Seniors from winning even more team titles! The intermediate age group was for young women aged 15 – 17. In early winter 1971 my newspaper cuttings indicate that Moira O’Boyle occasionally lost a race – shock, horror! She had won a silver Thistle Award for that year’s track season (1500 in 4:47.2) but finished second in the first league cross-country race. However by early November she was beating the 1971 Intermediate Scottish 1500m and cross country champion, Eileen Radka from Bathgate; and in the Scottish Women’s Western District Cross-Country Championships at Pollok Estate in early December 1971 Moira won the Intermediate two miles by fully 400 yards “an astonishing margin in a race of this length”. Her team won of course. Her mother Noreen was ninth in the Senior race. Moira O’Boyle’s success continued. She was VP Ladies Captain for 1972-73. The next cutting I have indicates that she continued to ‘murder’ the opposition over the country. On December 2nd, 1972, she retained her West District title. Then she was congratulated on her “fine performance at Watford on 16th December representing Scotland in the Inter-League Match.” However a major highlight came on 10th February 1973 in Edinburgh when Moira O’Boyle won the SWCCU Intermediate CC Championship by more than a minute. In the summer she did not improve her 1500 m best but did win the Wesy and the East v West events. Moira’s 3000 metres time improved to 10:05.8 and she on the West and West v East races. She improved to a silver medal in the SWAAA Senior 3000 metres, behind Ann Barrass again. Almost exactly a year later on 9th February 1974, at Milngavie, Moira achieved her most amazing feat so far when she won the Scottish Women’s Senior Cross-Country Championship and led VPAAC to victory in the team race. The report is as follows: “Fulfilling all expectations, Moira O’Boyle, Victoria Park, continued her already distinguished career by winning the title in 22:04. Although this is Moira’s first year as a Senior, she (like Jim Brown a week later) made her mark in this section at the first attempt. On this form, Moira might well be a medallist at the International Championships at Monza, Italy in March. Second in the Senior race was Dundonian Christine Haskett, now with Stretford AC, and third was the highly rated Ann Barrass of Aldershot. The fourth counter in the winning VP team was one Noreen O’Boyle who must have been immensely proud.” That summer, although 17 year old Moira did not improve her 1500 metres time (an error?) she broke the 10 minute barrier with 9:58.2 as well as winning the West and West v East again. The yearbook suggested that she was to be regarded as “mainly a cross-country specialist.” Nothing wrong with that! What a start to a running career! My own memories of Moira at this time are twofold. A newspaper photograph of her zooming away to yet another overwhelming victory reminds me of her face in a racing grimace: this was a young woman who always tried as hard as possible, despite the lack of opposition. In private she did not smile a great deal, but was mature and serious at 16, her eyes intense as she talked fluently about training and her ambitions in the sport. I do not know details about her training but she was rumoured to be piling up the miles, as well as working on speed endurance. She was an unusual person, attractive and unsettling in her relentless enthusiasm. 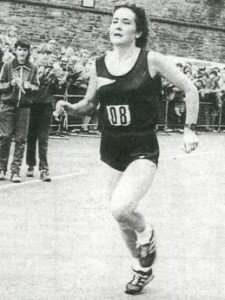 In 1984 she won the Belfast Marathon in 2:53:54 and with it her first Northern Ireland championship title. The following year she repeated the feat with a time of 2:45:40 and then in 1986 she picked up her third consecutive title with the fastest time yet – 2:43:26. This qualified her for the Commonwealth Games to be held in Edinburgh and there she finished eighth in 2:42:29. Every race faster than the one before and by this time she had become Moira O’Neill having married the Irish marathon internationalist John O’Neill . Her first, and as far as I can find out, her only run under 2:40 came in Dublin in 1987 where she won in 2:37:06 . Wikipedia reports that in 1989 she finished two minutes ahead of Liz Bullen but I can find no other record of this particular race. I can find no record of her running a marathon in 1989 but in 1990 she ran in the Commonwealth Games in Auckland New Zealand and finished twelfth in 2:48:52. Moira died from cancer on 29th August 2012, just a week after her 56th birthday. There is some information at http://insidetrak.blogspot.co.uk/ She still had the second fastest marathon time ever by a Northern Ireland athlete.